Mechanical keyboards are equipped with separate switches under the keys of keyboards. The array of switches under the keys is assembled in such a way so that user can vary the actuating force to press the keys.Technological advancements in mechanical keyboards and designing of switches are growing across the globe which helps in providing better products and enhanced experience to the user. 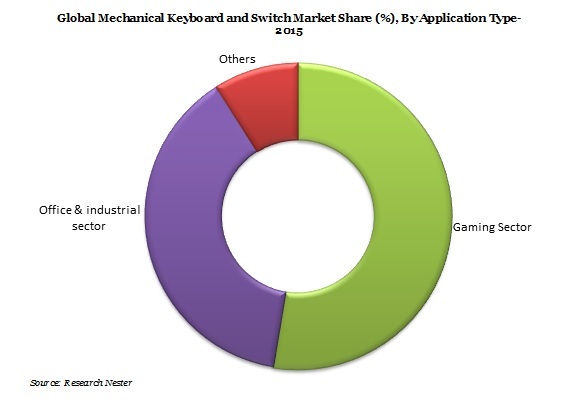 The global mechanical keyboard and switch market reached USD 602.1 Million in 2015 and the market is expected to garner USD 642.2 Million by the end of 2016. The mechanical keyboard and switch market is believed to expand significantly at a CAGR of 16.8 % during the forecast period i.e. 2016-2023 globally. North-America region is expected to showcase lucrative growth in the market of mechanical keyboard and switch across the globe. The market accounted for the largest revenue share of 38% in 2015 on account of presence of large number of gaming population and rapid growth in urbanization which increased the sales of PC across the globe. However, U.S. dominated the North-America market by registering the largest revenue share of 86% in 2015. On the other hand, European and Asia-Pacific region is expected to be the fastest growing market over the forecast period i.e. 2016-2023. Rapid pace in urbanization in both the regions and rising demand in office and industrial sectors are some of the major factors predicted to bolster the demand for mechanical keyboard and switch during the forecast period 2016-2023. Moreover, the mechanical keyboard comes with the facility to replace and repair of switches which makes it more convenient and cost-effective for the consumers. Growing gaming points and increasing awareness towards advanced mechanical keyboards are likely to gain traction of consumer in near future. The market of mechanical keyboard and switches is driven on the back of factors such as enhanced durability of keys, anti-ghost feature, increasing preference of gamers towards mechanical keyboards due to high accuracy and additional functions of key replacement and repair. Rise in gaming population, introduction of attractive PC games, increase in gross disposable income in developing nations and rapid urbanization across the globe are some of the factors which are expected to pave the market of mechanical keyboards and switches over the forecast period i.e. 2015-2023. Factors such as ease of availability, light-weight keyboards, introduction of attractive and low cost keyboards with advanced features, increase in gaming points in developing nations and rising demand of mechanical keyboards in internet cafes and corporate sector on account of its durability and fast response rate are swelling the demand of mechanical keyboard and switches across the globe. However, factors like presence of fewer regulations on manufacturing of mechanical keyboards, availability of membrane and touch keyboards at low cost, declining sales of PC’s, rising penetration of handy gadgets such as mobile, tablets and laptops are likely to hinder the growth of mechanical keyboard and switch market over the forecast period i.e. 2016-2023. Moreover, availability poor quality keyboards at low cost and availability of advanced substitutes such as joysticks and multi functioning mouse are some of the factors which are expected to restraint the growth of mechanical keyboard and switch market in near future. Huizhou Greetech Electronics Co. Ltd.